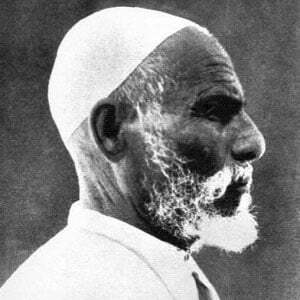 Remembered for his almost two decades of work for the cause of Libyan resistance against Italian rule, Mukhtar was executed by the Italian military in the early 1930s. In his early years, he studied at a mosque in his native Cyrenaica, Libya. He later attended Senussi University in Jaghbub. The Libyan Civil War of the early 21st Century used Mukhtar as a symbol of a liberated Libya. He lost his parents when he was young and was raised by the notable Libyan religious and political leader Sharif El Gariani. Eight decades after Mukhtar's death, then-Libyan president Muammar Gaddafi visited the Italian capital wearing a photo of the imprisoned Mukhtar and accompanied by Mukhtar's son.